Garmadon is a Ninjago minifigure first released in 2011. He is a major antagonist in earlier episodes of Ninjago: Masters of Spinjitzu in his role as Sensei Wu's evil brother and the father of Lloyd Garmadon, the destined green ninja. However, Garmadon is eventually redeemed and joins Wu and temporarily joins the Ninja as a second Sensei before sacrificing himself to defeat the Anacondrai. Lord Garmadon is the main villain of 2017's The LEGO Ninjago Movie, which takes place in a different continuity from the TV series. Garmadon is voiced by Justin Theroux. The movie emphasizes Garmadon's distant relationship with his teenage-hero son Lloyd. When Lord Garmadon initially appeared in sets in 2011. His head is black and demonic with red eyes, an opened mouth with white teeth, and various dark metallic/silver lines on his head. His torso is also black with printing on it reminiscent of ribs, as well as a purple belt above his waist. His arms, hands, legs, and hips are also black and left unprinted. He wears a silver coloured samurai helmet with a bone on it. In 2012 Garmadon was redesigned. His helmet is gumetal/iron and also has a white bone in it, and the helmet has been remoulded to feature a longer visor. He has the same face as last year's minifigure, with slight modifications. Rather than having one torso as his previous variation and most other minifigures, Garmadon has two. His first one is slightly smaller than usual and has dark grey armour moulded onto it which is fit to go over much of the lower torso also. Though much of it is covered by the armour, the torso underneath is the same as his previous variation. The black legs now have printing depicting the purple belt extending from the torso into a knot and split into two sashes. 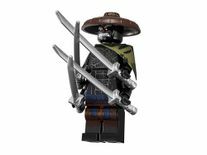 In 2013 Lord Garmadon still included the same head, torsos, and legs in the 2012 variation but was wearing the "Helmet of Shadows". This helmet is similar to Garmadon's previous helmet in 2012 but has the Stone Army symbol on it in black instead of the white bone and also includes a black visor that makes his face look similar to when he became possessed by the Overlord. However, in the TV show he also grew claws on his hands and feet and grew wings allowing him to fly. The minifig has normal hands and legs and does not feature wings. At the end of "Rise of The Spinjitzu Master", Garmadon was reverted to a normal man, free of the evil energy that had corrupted him. He appeared as an old man similar in appearance to Sensei Wu, but with a full head of graying hair instead of a beard. His old outfit had been transformed into the "special" kimono his brother wore in "Battle Between Brothers", a predominantly black kimono with white sleeves and golden Chinese characters written on the front. In 2014, Garmadon was introduced into his human form known as "Sensei Garmadon". He included a gray hairpiece, a new face, and a green robe with a tacky coat over it. A second variation of his "Sensei" robes was released, with predominantly black robes with gold and dark green highlights and white sleeves. The back of the figure also features part of the robe pulled back to reveal the tattoo of the Anacondrai. For The LEGO Ninjago Movie in 2017, Garmadon was reintroduced in physical form, back in his evil, four armed variation. There were five unique variants of Garmadon released, the most common one was heavily inspired by the 2012 variant, with noticeable differences. He has a more cartoonish face depicting an evil smile and a brand new helmet mold, resembling a samurai helmet. His ‘extra arm’ element was redesigned to be flatter and include armour printed on. The belt on the figure was also changed to be navy blue. One variation of the figure also includes a robe that goes around his front and back. Another released for the CMF line wears a rice hat instead of the helmet. Other variants for the Movie line include Jungle, Volcano and Flashback. Jungle features a shirtless variant of Garmadon, with a rice hat and small cape over one shoulder. It features the second torso element form the 2012 variant flipped around and printed on to resemble extra abs. Volcano variant depicts Garmadon in volcano themed pyjamas. He is still wearing his helmet in this variant. Flashback depicts Garmadon in a suit and tie, reflecting his attire in the ‘flashback’ portion of the movie. He is wearing sunglasses and has a blonde wig element. Garmadon is also playable character in LEGO Battles: Ninjago with his first variation and is unlocked after 100% completion of the game is reached. He is able to use telekinesis and teleportation abilities. He is also an enemy in door 4-4. Sensei Garmadon appears in LEGO Ninjago: Nindroids as a his blackened self, in his sensei garb, and disguised as a nindroid. Garmadon was ill for a time, tended to by his father and brother. Unbeknownst to anyone, Garmadon had been bitten by the Great Devourer, infecting his very being with pure evil. As a result, Garmadon became increasingly violent and selfish, blaming Wu for his change. However, it took many years for the devourer's venom to fully consume him and he sought a more questionable teacher and studied under Master Chen. Garmadon and Clouse, another student, became rivals and fought to be Chen's right hand man, to which Garmadon won by cheating. Under Chen's guidance, Garmadon won the heart of Misako by stealing a letter that Wu wrote and claimed it as his own. However, when Chen proposed they side with the serpentine, Garmadon refused and left Chen, deciding to fight alongside Wu instead. They managed to defeat the serpentine and banished the generals to the cursed realm, while Clouse and Chen were exiled to a secluded island. Garmadon remained inside his fortress until Sensei Wu snuck in and confronted his evil brother in the throne room. Garmadon sent a horde of Skulkin to retrieve the Sword of Fire, but Wu easily defeated them with Spinjitzu. Unperturbed by this, Garmadon sat on his throne and forced his brother to battle Samukai, who wielded the other three Golden Weapons. The Skulkin general was victorious and took the Sword of Fire. Once Sensei Wu returned to the Destiny's Bounty, he explained the situation; Lord Garmadon would be staying with them until Lloyd was recused from the Serpentine. Although the Ninja were skeptical of his cause, they agreed, and promptly discovered that their old foe had picked up several odd habits, such as brushing his teeth with a dagger, "sunbathing" in the middle of a raging storm, and eating nothing but Condensed Evil. During his stay, Garmadon was forced to deal with the suspicions of Kai, who was the most distrustful of his motives. The two ended up fighting after Kai spotted Garmadon holding the Golden Weapons. Kai eventually triumphed - however, to his disappointment, Garmadon allowed himself to be defeated as he was only gathering the Weapons at Wu's request. Despite the other Ninja's disapproval, Kai remained highly suspicious of Garmadon. Lord Garmadon stayed aboard the Destiny's Bounty while the Ninja were searching for the final Fangblade. When Lloyd suggested that they instead focus on retrieving the other three, Lord Garmadon pointed out that they had no idea where the Serpentine were hiding. This led Nya to realize that the snakes were hiding underground, and the two Garmadons remained aboard the ship while the Ninja investigated the Serpentine's main base located in the Constrictai Tomb. Unable to resist such an opportunity, Garmadon attempted to hack into the Destiny's Bounty computer systems to gain information on the Ninja. When Lloyd discovered him and accused him of betraying the Ninja's trust, Garmadon admitted that he couldn't help it, having evil literally running through his blood. He also took the opportunity to tell Lloyd that Sensei Wu had a great destiny set for him, and that Lloyd could still make whatever choices he wanted for his life. When Nya reported that they were captured by the Serpentine and being held hostage, Lord Garmadon attempted to help, but Lloyd refused to allow him, demanding for his father to leave instead. Unfortunately for Lord Garmadon, Pythor snuck aboard the ship and reclaimed the Fangblades, allowing him to return to The Lost City of Ouroboros and awaken the Great Devourer. As Lord Garmadon was visiting Ninjago City's tea shop, looking to return to his dark dimension, a news report showing the Ninja struggling to contain the Devourer came on the nearby television. He immediately hurried to the battlefield, arriving just after the Great Devourer defeated the Ultra Dragon, and told the Ninja that the only way to defeat the Devourer was to use all four Golden Weapons at once - which only he could do. After sneaking out of Ninjago City, Garmadon found the remaining Serpentine and won them over by demonstrating his newfound powers, recreating the destroyed Destiny's Bounty as the Black Bounty. Offering the new ship to the Serpentine, Lord Garmadon gained the allegiance of the snakes - apart from Skales and the other Generals - and led them aboard the Black Bounty. For his next plan, Lord Garmadon created a false company, "Darnagom Enterprises," and attempted to destroy Dareth's dojo, where the Ninja were training Lloyd. To get the money they needed to save the dojo, the ninja entered the annual Ninjaball Run - when Garmadon found out, he joined the race himself with the Black Bounty. When the ship's cannon fire missed the Ultra Sonic Raider (thanks to the Ultra Dragon bumping into the Black Bounty, and the Serpentine warriors failed to prevent the Ninja from refueling on the fly, Garmadon used the Mega Weapon to create a vast chasm that the Ninja would never be able to cross. Bent on destroying the Ninja once and for all, Lord Garmadon retreated to Ouroboros, which he apparently repaired at some point to make it livable again. While preparing his forces for a final assault, he was ambushed by the Ninja, including a teenage Lloyd. Shocked at his son's growth and improved powers, Garmadon retreated, wishing that the Ninja had never existed in the first place - this gave him the idea to create a portal to the past and change the future to ensure that Lloyd would never become the Green Ninja. Disguising himself as a Skulkin, Lord Garmadon snuck aboard the Skull Truck and deliberately prevented the skeletons from abducting Nya, intent on removing Kai's motivation to become a ninja. On the way back to the Underworld, he overheard Nuckal commenting that he thought he saw two Kais, and realized that the Ninja of the present had followed him to the past. Lord Garmadon was in the Skulkin camp in the Forest of Tranquility when the Ninja secretly delivered Nya to the skeletons; to counter the Ninja's interference, Garmadon sought the aid of his own past self, quickly explaining the situation and formulating a new plan. With his Mega Weapon destroyed, Lord Garmadon pursued other means of gaining power; namely, seeking out the Island of Darkness mentioned in Captain Soto's journal. Taking the Serpentine Generals along, Garmadon rode a Rattlecopter over the Endless Ocean, looking for any sign of the island. At that point, Skales tricked Garmadon by claiming to see the island - when Garmadon went to look, the Hypnobrai General pushed him out of the Rattlecopter and declared himself leader of the Serpentine. Lord Garmadon proceeded to set up a base camp where the ultimate weapon could be constructed, monitoring the Stone Army's progress on both building the weapon and mining Dark Matter. The Overlord appeared again there, warning him that the Ninja had made it to the Island of Darkness in search of The Temple of Light. Garmadon deployed his forces to capture the Ninja, only to eventually learn that the heroes had succeeded in their quest, enhancing their powers far beyond their previous limits - worse yet, Lloyd had gained the power of the Ultimate Spinjitzu Master, making him even stronger. As the Celestial Clock continued to count down, Lord Garmadon began increasing the defenses around his camp, worrying that the Ninja might try to attack him directly before the ultimate weapon could be completed. The Overlord commented that his resolve seemed to be wavering, despite Garmadon's denials. The Overlord's prodding over his reluctance to kill Lloyd eventually caused Garmadon to snap at nearby soldiers, telling them to double their effort on the ultimate weapon's development. When General Kozu came in to report capturing a prisoner, Garmadon was surprised to see his wife, Misako. They former couple argued about Garmadon's path to evil, and the villain admitted that he had wanted Misako to see things his way so she could rule by his side. 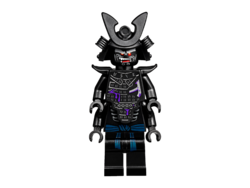 As he lamented that Misako was one of a very small number of people who could truly understand him, Garmadon realized that he had been tricked - Misako had stolen the Helmet of Shadows in a last desperate attempt to halt the Celestial Clock. Enraged at the deception, Garmadon pursued Misako and the Ninja in a massive, four-armed robot that proved immune to anything his foes threw at him. When the Overlord reminded him that the Ninja could turn the Stone Army against him if they wore the Helmet of Shadows, Garmadon resolved to chase them down personally, conducting a furious chase through the jungle. Just when he finally had the Power Drill in his grasp, Lloyd arrived and disabled the robot with a powerful blast. Garmadon orders the Dark Matter. Shortly after the completion of the Garmatron, the Stone Army arrived before Garmadon, presenting his recovered helmet as well as a prisoner - Nya. Garmadon tested the Dark Matter on Nya, transforming her into a loyal servant. Ordering Nya to ambush the heroes if they followed him, Lord Garmadon boarded the Garmatron and set out for the coast, accompanied by the Overlord and the Stone Army. After arriving on the coast, Garmadon ordered the Stone Army to begin loading Dark Matter into the Garmatron's main cannon, but his actual attack was delayed when Lloyd, Misako, and Sensei Wu arrived. Garmadon furiously denied their pleas to stop his actions, declaring that he was too far gone for any hope of redemption - the only way he could reunite with his family was to make them (along with the rest of the world) as evil as he was. With that, Garmadon activated the Garmatron's main cannon, only to discover that the weapon required a twenty-second warm-up period. Lloyd attempted to stop the countdown, and briefly grappled with his father before Kozu pinned him down, allowing the Garmatron to fire on the village of Ignacia. Trying to prevent Garmadon from firing again, Lloyd summoned his powers in an attempt to escape Kozu's grip. In response, Garmadon used a hidden trapdoor to drop Kozu and Lloyd out of the Garmatron. Garmadon is infested by the Overlord. With Lloyd out of the way, Lord Garmadon fired his next Dark Matter missile at Jamanakai Village, upsetting the balance of light and darkness enough for the Overlord to begin manifesting in Ninjago. It was then that Garmadon discovered the truth: the Overlord had no intention of letting him rule Ninjago. Outraged at being a pawn in the Overlord's game, Garmadon furiously insisted that Ninjago was his to conquer, but the ultimate evil simply laughed as he possessed the four-armed villain's body to begin his metamorphosis. Garmadon attempts to fight back. Garmadon purified and reunited with his family. Hoping to make up for all of his evil actions, Garmadon made a vow never to fight again. He and Misako moved far away from New Ninjago City where they opened up a monastery to teach the next generation of Ninja. Fleeing the Digital Overlord, the five Ninja and Nya traveled to Garmadon's Monaster to seek refuge. That night, they partook in Garmadon's lesson on The Art of the Silent Fist, a martial arts style that involves misdirection and avoiding the attacks of enemies. He handily defeated Lloyd in a sparring session, invoking his son's anger, but cautioned his son against giving in to such feelings, having been overcome by rage himself in the past. Upon learning that the Nindroids are seeking Lloyd and his golden powers, Garmadon volunteered to travel with Lloyd and get as far away from the Digital Overlord's grasp as possible. Garmadon and Lloyd drive away. Garmadon points the way forward. As they passed through a rocky gorge, Garmadon paused to teach Lloyd about balance by placing rocks on him. When he plunges a boulder on him, all the rocks topple on Lloyd, and he does Spinjitzu to shower them off. Lloyd and Garmadon go up a steep part of the mountain, with Lloyd not allowed to use the Golden Dragon. Garmadon and Lloyd eventual came to a broken bridge and Garmadon ordered his son to move the mountain in front of him to create a path across. The Golden Ninja failed and frustrated, uses the Golden Dragon to create a Golden Path for them. Garmadon and Lloyd made inside Hiroshi's Labyrinth, and Lloyd comments that whoever made it through the jungle was better than him. Garmadon also comments that there is an oasis at the middle of the jungle, that no one has seen before. "When you took my son, all bets were off!" Garmadon followed the MechDraon back to New Ninjago City wherein he disguised himself as a Nindroid to sneak into Borg Tower. He arrived in Borg's Office just as Techno Wu was about to suspend the program, thereby trapping the Ninja in the Digiverse. Garmadon flung his assimilated brother out the window before revealing himself and attacked Pythor, claiming that as they took his son, he had done away with his oath never to fight again. Garmadon saved by his newly-restored brother. After the Serpentine managed to escape in a Hover-Copter, Garmadon slid down the side of the building where he faced Techno Wu again. The battle quickly turned against Garmadon's favor and he was forced to retreat to the very edge of the cell tower. However just as Techno Wu prepared to finish him off, the Ninja successfully rebooted the system, thereby returning Wu to his regular self. Garmadon accompanied Wu and the other Ninja back to the Temple of Light wherein Lloyd returned his elemental powers to the four Ninja. Garmadon voiced his disprovable of the plan to Wu, who in return reminds him that it was Lloyd's choice, not his and encourages the Ninja to take risks. Garmadon remained optimistic, knowing that as the protectors of Ninjago, they were without the luxury of rest. Garmadon watches as the rocket takes off. Garmadon returned to his monastery and was there when Wu and Nya began work on plans to restore the Destiny's Bounty. When Nya inquired if he would care to help, Garmadon agreed and went to Lloyd's room to ask if he wanted to help as well, only to find his son packing. Though Lloyd claimed the Ninja were going on a fishing trip, the lack of Lloyd bringing his fishing pole and a discarded box from Chen's noodle shop made Garmadon realize what was going on. Sensei Wu's evil brother who was banished to the underwold after he failed to collect all the four golden weapons. Now plotting to rise to power once again and recreate Ninjago in his own image. Garmadon is the brother of Sensei Wu. As a young man, he was bitten by The Great Devourer and became Lord Garmadon. Merciless and sinister, he became an enemy of Sensei Wu and the ninja team. It was only when the Overlord was defeated that Garmadon was freed from the darkness. He no longer believes in violence of any kind, and is focused on trying to raise his son, Lloyd, the right way. But is he really reformed, and can he stick to being peaceful in the face of the Nindroid threat? LEGO Club Magazine Issue 1 2014 - "Battle in the Skies"
Lord Garmadon wearing the Helmet of Shadows. Garmadon leading the Elemental Alliance into battle during the Serpentine Wars. Garmadon is the brother of Sensei Wu. As a young man, he was bitten by The Great Devourer and became Lord Garmadon. Merciless and sinister, he became an enemy of Sensei Wu and the ninja team. It was only when the Overlord was defeated that Garmadon was freed from the darkness. He no longer believes in violence of any kind, and is focused on trying to raise his son, Lloyd, the right way. But is he really reformed, and can he stick to being peaceful in the face of the Nindroid threat? This page was last edited on 20 March 2019, at 21:40.